My husband and I are really getting excited about our upcoming trip to your area. We have been avid campers all our married life. 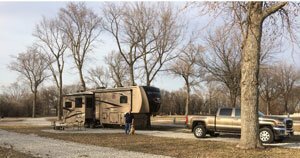 Our first camper was a pull-type that we got in the early 1970's. We have had four or five since then. We are now traveling in the rig that you see in the photo to the right. Now that Jerry is retired, we are looking forward to seeing our country. It is our goal to visit all of the lower 48 plus Alaska. We took care of part of that three years ago when we took four months for Jerry's retirement trip to the west coast, British Columbia and Alaska. It was a dream trip. A second dream trip is to the Northeast. That is this year's trip and you are on our agenda. Are you a beginner? Would you love to learn how but are afraid that it is just too complicate? I would like to encourage you to take my class. 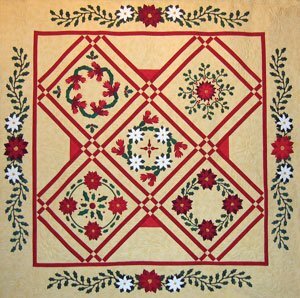 We will discuss the tools necessary for applique. Then over the course of 5 hours, I will teach you the four elements of hand applique. 1. Outer curves 2. Inner curves 3. Outer points 4. Inner points. You will have plenty of time to try each technique. I will help you and will answer any questions that you may have. You will be sent home with the pattern to the right, Each block in this quilt will introduce one of the 4 elements. The first block in the upper left is made up entirely of outer curves. The second block (lower left) adds inner curves, etc. Make this wall quilt at your own pace at home. By the time you are done you will be an experienced appliquér. 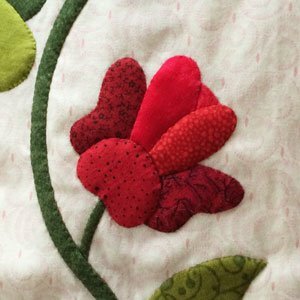 Are you an experienced appliquér but can't decide if you want to take my workshop or not? Let me tell you a little about it. 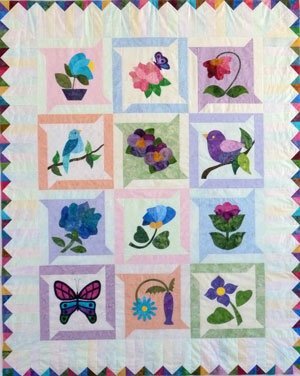 One of the techniques that is included is how to line applique patches and how to sculpt applique patches. You will get to either line a patch or sculpt a patch or both if you work fast. The photo to the right shows a flower that has been sculpted. I have used two types of batting. I'll tell you all about them in class. 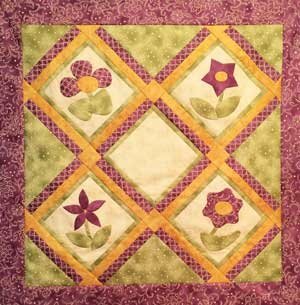 If you don't already know how to make a quilter's knot you will need to learn. There are a number of good YouTube videos that demonstrate this knot. Click on this link to go to one of them. I don't know the individual teaching this knot, but she does a nice job. The quilter's knot is just one of two knots that you will need to learn. I usually don't take the time in class to teach these knots. I will give you a link to the other knot next month. 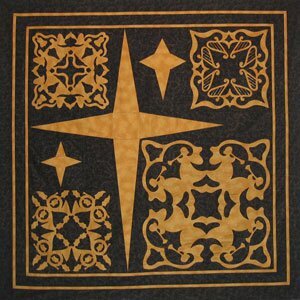 "Celestial Chorus" is a quilt that is often made by quilter's for their church to use at Christmas time. The blocks include "French Horns and Holly", "Trumpeting Angels", "A Chorus of Harps" and "Angels and Bells". I won't be bring this quilt, but I will have the pattern with me should you be interested in making it. 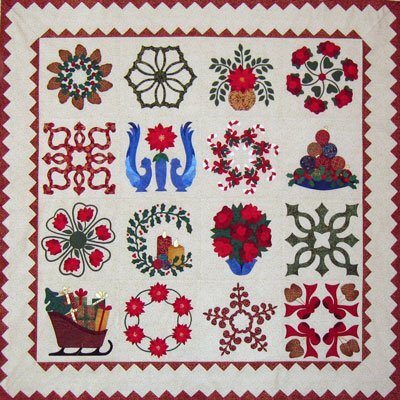 "Christmas in Baltimore" has 8" blocks making it a smaller version of a Baltimore quilt.